Easter is just around the corner. Have you started planning your family meal yet? If you’re one of the many families who traditionally enjoy ham on Easter, we have an exciting way to put a new twist on this old standby: add honey! Honey is a delightful way to add a little spring sweetness to the holiday, so try cooking up this honey and rye glazed ham, made with our raw honey from Hawaii. In a mixing bowl, combine the whiskey, honey, molasses, red pepper flakes and black pepper. Our Winter Blend Honey would be especially good in this recipe as it has a bold caramel flavor that will complement the molasses and whiskey. Whisk them together until a uniform sauce is formed. Set this aside while you work on the ham. Set your oven to preheat at 350 degrees F. While the oven is heating, transfer your ham to a large roasting pan. Put approximately 2 cups of water into the bottom of the roasting pan. This will prevent your sauce from scorching. Then, score the ham in a crisscross pattern, slicing about 1/8 – 1/4 inch down into the fat. 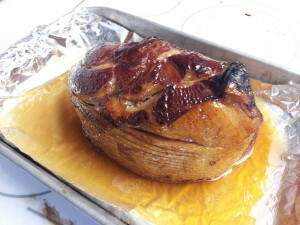 Brush the ham with the honey sauce, and place it in the oven. Bake your ham for approximately 1 1/2 – 3 hours, or until the internal temperature reaches 135 degrees F. Baste it with the sauce every 20 minutes during cooking. When the ham is finished baking, let it rest for 10 minutes, and then slice it thinly. Drizzle the pan juices over it before serving. There are so many delicious things to cook with honey this spring, from ham to Brussels sprouts. Visit Hawaii’s Local Buzz to stock up on local, raw honey for all of your Easter and spring cooking.